1. 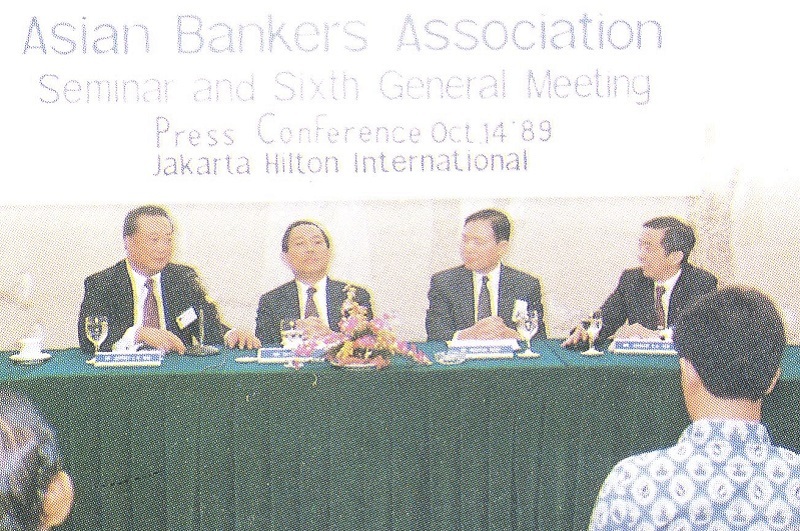 The 6th General Meeting of the Asian Bankers Association was held in Jakarta, Indonesia on October 12-14, 1989. 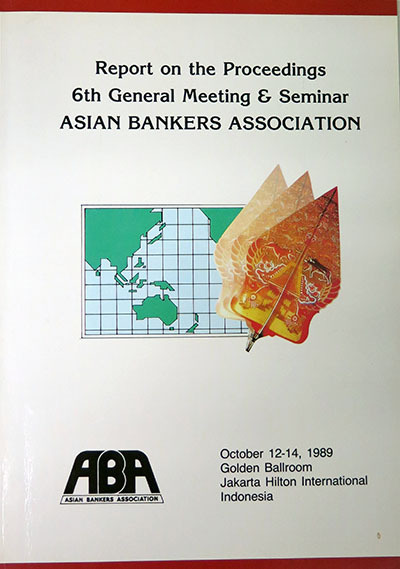 The General Meeting proper was preceded by a Seminar held on October 13th which had for its theme: “Political Economic Transformation of the Asia-Pacific Region in the 1990’s” and a meeting of the ABA Board of Directors on October 12th. 2. The meeting and seminar was attended by some 125 participants coming from member and non-member banks. The Honorable Professor Dr. J.B. Sumarlin, Minister of Finance of the Republic of Indonesia gave the opening address after Mr. Patrick Yeah, Chairman of ABA, made his opening remarks as presiding officer. 3. The Seminar topics were chosen in the midst of prevailing situations described as follows: “Protectionist sentiments, the threats to the multi-faceted trading system, the emergence of trading blocs, the effects of financial reforms in Japan, the expansion of intra-Asian trade and investment, the recent political developments in China and the general relaxation of political tension in Asia are some of the events taking place in the Asia-Pacific.” It was designed to elicit answers to the following questions: What are the problems, prospects and opportunities posed by these events? And what are the implications to the banking industry? 5. Dr. William H. Overholt, who is Vice President of the Bankers Trust Co. and Director of B.T. Brokerage Asia based in Hongkong and member of the Board of both B.T. Brokerage Asia and B.T. 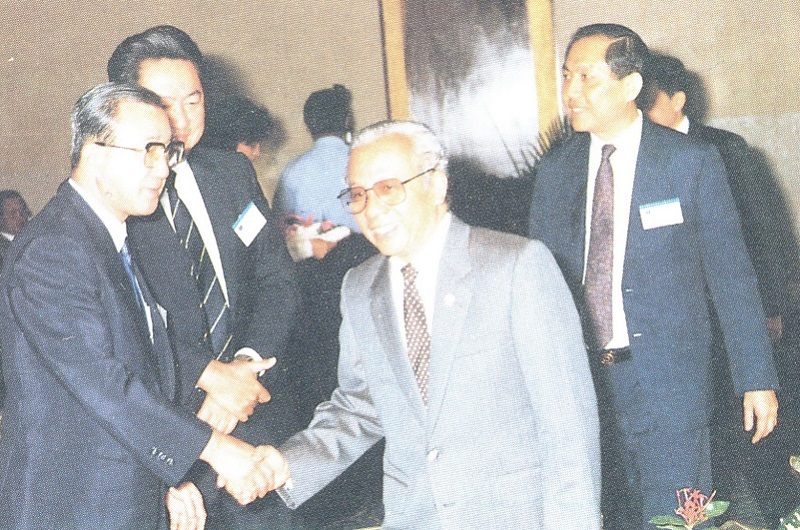 Brokerage Philippines, talked about the social and political aspects of the Asian economic miracle which he predicts will be sustained for the 1990s and presented the basis for his assessment. First, he reviewed economic events from the 70’s and how Asian resilience overcame all the shocks and challenges that threatened and periled the region and which instead finally led to the Asian economic miracle. Dr. Overholt concluded by saying that the Asian economic miracle will continue indefinitely and that it is going to consolidate the social and political bases for its continuation. 6. 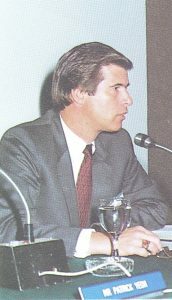 Ambassador Philip J. 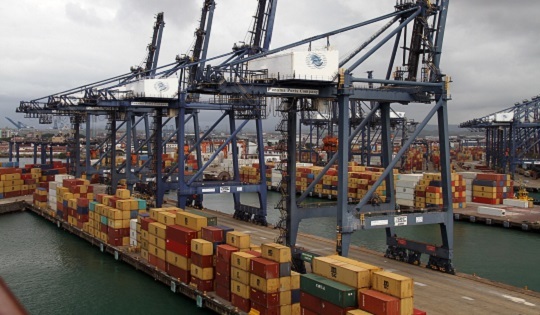 Flood of Australia discussed the directions of Asia-Pacific cooperation, citing the recent economic and political trends in the region, the options for future action by governments and the membership and mechanisms for enhanced regional cooperation. He pointed to the challenges of shifting complementarities taking place in technology and investments, the trade tensions and protectionism both in the region and markets abroad which are prompting the need for enhanced cooperation and more imaginative action by governments of the region. 7. Drs. 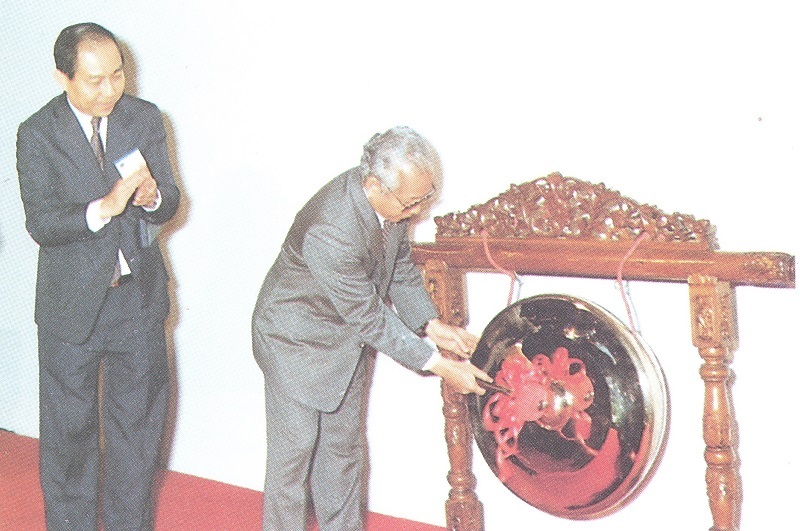 Binhadi, Managing Director of Bank Indonesia, traced banking development of Indonesia and the banking and monetary policy of the country which finally resulted in the recent deregulations brightening the prospects of banking. 8. Dr. Sarasin Viraphol, Ambassador attached to Thailand’s Ministry of Foreign Affairs, described recent events and trades in the countries that comprise Indo-China particularly Vietnam. He said that the vital component of Hanoi’s doi moi strategy is the attraction of Western assistance, investment and technology. In conclusion, he said that the prospects of trading with all these war-torn countries in Indo-China are undoubtedly promising. 9. Former Vice Minister of MITl’s International Affairs, Makoto Kuroda described the structural adjustment being made by Japan and how it is coping with challenges and pressures faced by the country. 10. Commentaries were made by Mr. Heinz Jungjohann, General Manager of Dresdner Bank AG Singapore Branch; Dr. Mochtar Riady, Chief Executive Director of Bank Central Asia; Prof. Dr. Mochtar Kusuma-Atmadja, Former Foreign Minister of Indonesia and Dr. Jeffrey L.S. Koo, Chairman and Chief Executive Officer of China Trust Co., Ltd. The commentators generally confirmed most of the presentations and elaborated and focused on some points made by the speakers re-affirming the conclusions made whi.ch exuded confidence and optimism in the region’s future. 11. The speeches and commentaries as well as the questions raised and answers made are published in full in the ABA Journal of Banking and Finance, Vol. IV No. 2, 1989 which is a companion publication to this report. 12. The General Meeting was highlighted by the Report of the Chairman, Mr. Patrick Yeoh on the activities of ABA under the guidance of the policy resolutions by the Board. Mr. Yeoh presented decisions of the Board to advance a professional development program – to encourage and promote exchange programs and to co-sponsor training and advanced banking management programs with prestigious institutes. 13. He also cited the increased of membership by more than 20% which affirms the value and functions of the Association. His report is cited in Annex A. 14. The Board of Directors also convened as earlier stated. The Minutes of the 12th meeting of the ABA Board are in Annex B of this Report.